Q. What are the key challenges of managing operations in your environment, considering that you have aggressive growth plans? A. We are a multi-brand car service company. We are sandwiched between brand companies offering high quality service at high prices and unorganized local garages offering ï¿½not-so-greatï¿½ quality at dirt-cheap prices. Our offer of high quality at reasonable prices is attractive to people looking to move away from unorganized garages. The challenge is beating single brand service centers in service delivery. Parts management comes in the way ï¿½ the number of parts that a brand service center has to hold is much lower than what we have to hold. Expanding rapidly without applying one’s mind to the inventory conundrum can spell doom for a multi-brand service company. Q. You have started implementation of TOC (Theory of Constraints), processes for parts management and service operations. What hasbeen the thinking behind this decision? A. Vector Consulting Group, our partner on this transformational journey showed us the merit of the TOC approach of exploiting sales opportunities with existing infrastructure and improving ROI before pushing for accelerated growth. We are focused on improving services and inventory management, cluster by cluster. Q. What key changes have you brought in? A. Since TOC implementation requires hub and spoke model, as a first step we grouped the company owned workshops across India into clusters. We kicked off the implementation along with Vector Consulting Group in the Chennai cluster and put in processes of TOC replenishment for spare parts while creating a hub and spoke model of inventory locations allowing for maximum aggregation benefits at the hub. TOC operations processes were implemented to cut down service lead times. 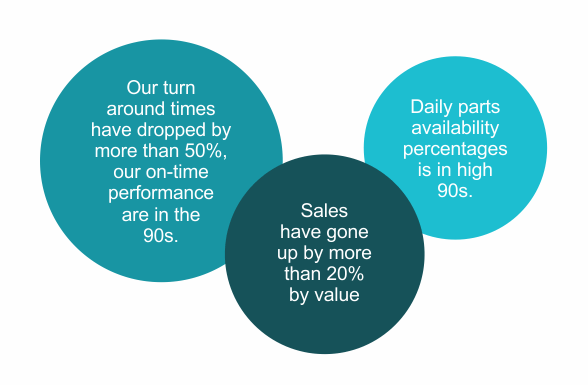 Our turn around times have dropped by more than 50%, our on-time performance is in the 90s. We can now guarantee completion of running repair jobs in four hours, we are willing to pay a penalty if we fail to do so. The parts availability is in the high 90s. More importantly, we have made the environment stress-free for our operations team. Sales have gone up by more than 20% by value in the Chennai cluster (for the restricted models) where we are doing the first phase of implementation. We have also seen the ticket size going up because of the decoupling of inspection and actual repair work.